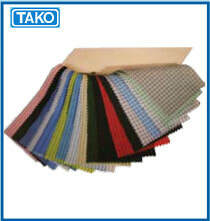 - Material : 100% polyester with conductive yarn in striped and grid pattern at 5mm interval. It effectively dissipates static charges generated from human movement. - It is ideal for cleanroom environment and electrostatic sensitive workplace. - It is washable, durable and has good ventilation.